Bihar Intermediate Time Table 2019 Download For Science, Arts, Commerce: The BSEB 12th class timetable has been released. All the candidates who are studying class 12th are get ready to write exams from February 6 to February 16. Students can check bihar intermediate exam date 2019 and download the the Intermediate time table in the PDF format from the Bihar intermediate board official website: biharboardonline.bihar.gov.in. The BSEB Intermediate exam will be conducted between February 6 and February 16, 2019. The examination will be conducted in two shifts. First sitting exam will be conducted between 9:30 am and 12:45 pm while the second sitting will be held between 1:45 pm and 5 pm. The first 15 minutes time will be provided to read the question paper and the duration of exam will be 3 hours. 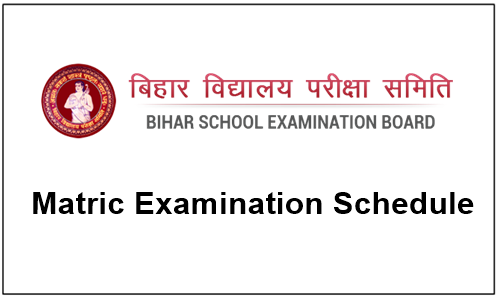 Bihar Board or BSEB has also released date sheet for Matric exam 2019 and the time schedule for the BSEB senior secondary examinations today. Secondary School Examination, the Board also conducts departmental examinations (not on yearly basis) such as Diploma in Physical Education, Certificate in Physical Education and Teachers Training Examination on such terms and condition as laid down by the State Government. 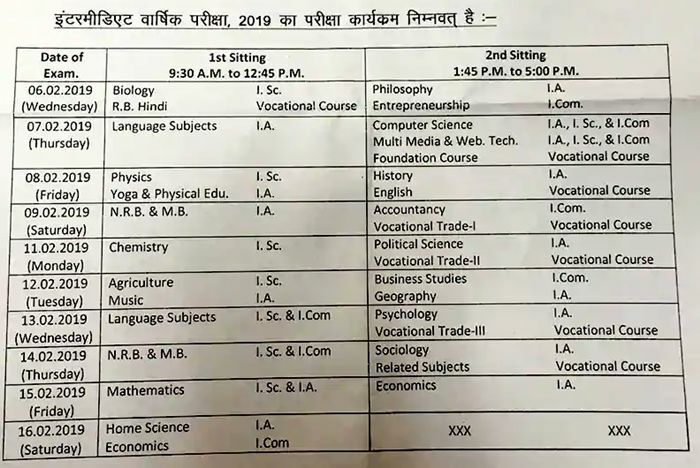 The candidates may check the BSEB class 12 or intermediate time table 2019 here: Programme for intermediate (+2) science, arts, commerce & vocational course main (annual) examination 2019 Schedule. According to the time table notice, a “Cool off” time of additional 15 minutes has been given to the examinee. The student has to use the “Cool off’ time for reading and analysing the questions and to plan the answers accordingly. The candidate is not supposed to write answer of any question during the “Cool off’ time. Go to the official website:”http://biharboardonline.bihar.gov.in“.